One of the easiest to identify large birds in this area, is the Turkey Vulture, which is fairly common throughout North America. When they are sighted, gliding high on the thermals, they appear to hardly flap their wings at all, as they maximize the currents of warmer air to stay aloft and gain altitude. The feathers of these birds are brownish-black, and in this picture you can see the distinctive dark and light pattern on the underside of the wings, this is unlike any other large bird in the area, and makes them easy to identify. These birds have a 6 ft wing-span, so they are really large and difficult to miss when they are nearby, although they could be mistaken for an Eagle or other Raptor at a distance. It is not easy to distinguish between the sexes, however, typically the female is slightly larger than the male. These birds prefer to breed in out-of-the-way places, usually in heavily wooded areas, building their rough nest in a cavity in a tree, on a rocky ledge or cave. The white mottled eggs take around 4 - 5 weeks to incubate, with the nestlings taking a further 10 or 11 weeks to become fully fledged and ready to leave the nest. In this picture, the red head is clearly visible and you can see that it is devoid of feathers, which is an evolutionary adaptation which makes it less likely to be soiled by the meat that the vulture is eating - making the whole process more sanitary. In this part of Southern Ontario where we live, in Elgin County, we sometimes see these birds flying singly, but more often we observe them in groups of 6 - 16 individuals, as they circle around overhead. Often, when I observe them, they seem to "wobble" to adjust themselves, and then they continue to glide, as they scan the ground for signs that would indicate that there is a meal to be had nearby. 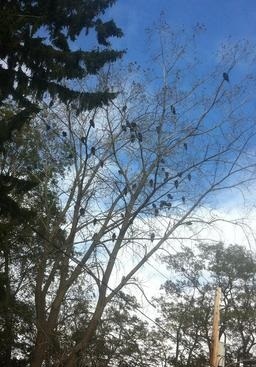 I took this picture in the summer of 2016 when I saw around 20 Turkey Vultures resting in a tree in Port Stanley. The picture is not very clear, but it shows several Turkey Vultures sunning themselves on a dead tree near the centre of the village highway 4, south of St Thomas. They prefer the meat of herbivorous animals (plant eaters) such as rabbits, squirrels and hares, rather than the flesh of carnivores (meat eaters) such as dogs and foxes. Turkey Vultures ONLY eat meat that is already dead and do not hunt or kill their own food, so they pose little danger to pets or small children. They must be very successful in their particular niche, on their own special rung of the food chain ladder, as there are lots of them around! The best place in this area of Southern Ontario that I know of, is just south of London - at the corner of Scotland Drive and White Oak Road - there are sometimes up to 40 or so of these birds sitting in the trees on the north side of the road. My family always describes the Turkey Vultures as the "Clean-up Crew" as they take care of a wide variety of dead animals and use both their sight and sense of smell to guide them to their food. Their diet is varied, ranging from the remains of an animal killed by predators, animals that die of natural causes, to animals killed by cars on area roads and includes squirrels, raccoons , rabbits and possums. Until 1994, these Vultures were classified with birds of prey, such as Hawks and Eagles, however, due to recent DNA analysis and other studies on anatomy, physiology, and behavior, these Vultures have been reclassified and placed in the Stork family. 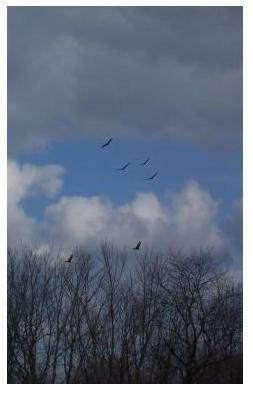 This picture of circling Turkey Vultures was taken in spring 2007 near Eagle, Ontario, and shows six individuals of what was a group of around 12 birds. Interestingly, a group of Vultures on the ground is known as a "Venue" and Vultures circling in the air are a "Kettle". 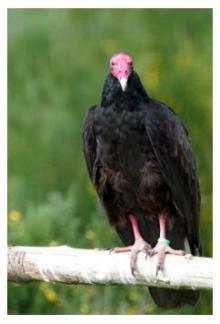 Have you seen Turkey Vultures? Remember to make your submission a minimum of 100 - 200 words and tell us when and where you saw the bird, the time of day, and what you observed them doing. Do you have a picture of the bird you saw? Great! Click the button and find it on your computer. Then select it - our readers would love to see it. What type of bird was visiting Brampton? Two Turkey vultures playing like a steeple. October 3, 2016 5:00 pm In LaSalle, Laurier Drive South west of Windsor, Ontario. Gathering of 25-50 birds circling for about 1 - 2 hours. Saw a bunch of these guys on the beach in Port Stanley and got this shot - one of my favorites!! Thanks for another lovely picture, Lisa! This is one of the top places in Ontario to observe raptor migrations. 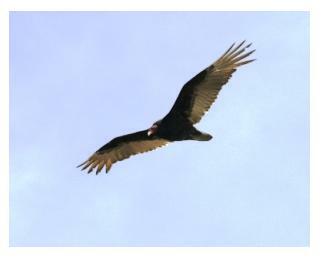 In October 2005 over 3,000 Turkey Vultures were spotted in one day! The following day 62 Bald Eagles were sighted there also. A great source of information for anyone interested in finding out more about these intelligent and fascinating birds, there are lots of questions and answers for the curious!